When President Barack Obama was sworn into office, only 13 states had legalized the use of marijuana for medical purposes and none allowed its recreational use. By the time Donald Trump was inaugurated, those numbers had grown to 28 states (plus Washington, D.C.) where medical marijuana is legal and eight states (and D.C.) where recreational use is permitted. And in the months since, another state — West Virginia — passed a law legalizing medical use, Vermont’s state legislature became the first in the nation to pass a recreational legalization bill (though it was vetoed by the Governor and sent back for changes), and several other states have begun to consider their own legalization proposals. Though marijuana remains illegal at the federal level for any purpose, attitudes towards its legalization at all levels are changing, and changing quickly. In recent years, we’ve seen ballooning support in public opinion polls, substantial policy shifts in the White House, a willingness to address the issue in Congress, and state policymakers taking it up in growing numbers. As more states enact and implement legal marijuana programs, there is a growing urgency for federal policy change to ensure that states regulate as responsibly and safely as possible. Since 1970, marijuana has been illegal under the federal Controlled Substances Act, listed as a Schedule I drug. That means for the purposes of federal law, marijuana has no currently accepted medical use and has a high potential for abuse — just like heroin, LSD, and ecstasy. At that time, marijuana was also illegal under the laws of every state. But over the last two decades, the map of state marijuana laws has undergone a significant transformation. California was the first state to legalize marijuana for medical purposes in 1996. Other states gradually started to follow suit, and what began as a trickle has now become a flood. In the last few years, the number of states passing laws to allow the legal use of marijuana in some form has skyrocketed. Today, 29 states have legalized medical marijuana, eight of which also permit recreational use, and another 17 allow the limited use of non-intoxicating marijuana extracts to treat certain medical conditions (like seizure disorders in young children). Roughly 201 million Americans (60% of the country) currently live in states where marijuana is legal for general medical use — up from 62 million ten years ago and 32 million ten years before that. And nearly 70 million (21%) live in states where recreational use by adults is also allowed, up from 12 million in 2012 and 0 in 2011. All told, roughly 98% of Americans live in a state that has legalized some form of marijuana—up from 0% just 21 years ago. Marijuana is now legal under state laws on both coasts, in the north and south, in red states and blue states, and even in the heartland. Just last fall, Maine and Massachusetts became the first states on the east coast to legalize recreational marijuana, Arkansas became the first state in the Bible Belt to legalize medical marijuana, and the passage of a recreational legalization initiative in California will soon significantly expand the size of that market. Banks can’t safely provide services to marijuana-related businesses—even in states where those businesses are legal, forcing the market to operate in all-cash and making it difficult for states to tax and regulate marijuana businesses. The landscape has massively shifted across the country. No longer is marijuana legalization the province of a few rogue states—it has become the new normal. Very few issues can match the rapid uptick in public support that marijuana legalization has seen over the last two decades. Medical marijuana, in particular, is popular amongst just about every demographic group. And while support for recreational legalization lags somewhat behind that for medical, it remains well above the 50% mark and continues to rise. Recent public opinion polls put support for medical marijuana in 2017 at 88% and 93% nationwide, which is consistent with the numbers we found in our own 2014 poll. Our data showed overwhelming support for medical marijuana among typically less supportive demographic groups like Republicans, women, and people of color. Even among those who oppose legalizing recreational marijuana, a majority support allowing its medical use. Support for legalizing recreational marijuana has long lagged behind medical, but it is rapidly gaining. In 1969, only 12% of the country agreed with the statement, “the use of marijuana should be made legal.” That percentage had only increased to about 33% by the early 2000s. It wasn’t until the next decade that things really began to shift. In 2014, two years after Colorado and Washington voted to legalize recreational marijuana, public support for legalization hit the 50% mark nationwide. By 2017, polls clocked current support at 61% and 60%. The chart below from the Pew Research Center illustrates this remarkable shift over time. This increase in support for marijuana legalization is happening across age groups and political parties. Millennials remain the most supportive of legalization, with 71% in favor, but large gains have been made among older generations as well. According to the most recent Pew polls, 57% percent of Gen X-ers support legalization, as do 56% of Baby Boomers. The only age group who still opposes legalization at this point is the Silent Generation, made up of people 71 and older, among whom only 33% favor legalization. And while Democrats and Independents tend to be more supportive of legalization (polling in the high 60s), Republicans now only oppose it by a 7-point margin, with 46% in favor of legalization and 53% against. That’s a more than a 20-point increase in support among Republicans since 2010, when less than a quarter favored legalization. Young Republicans in particular are leading that shift: in early 2015, 63% of Millennial Republicans supported legalizing marijuana, and given the overall shift that is occurring, that number has likely grown over the past two years. Even more ardently than Americans support legalization, they oppose federal enforcement of the marijuana ban in states that have chosen to legalize medical or recreational use. A poll by CBS News in April 2017 found 71% of Americans opposed the federal government taking action to stop the sale or use of marijuana in states where it is legal—including majorities of Democrats, Independents, and Republicans. An April 2017 Quinnipiac poll showed similar findings, with 73% of Americans opposing government enforcement of federal marijuana laws in legal states. In fact, not a single political party, gender, education, age, or racial group supported federal enforcement of the ban where a state has legalized. As evident from these poll numbers, the last several decades have seen a striking shift in public opinion on marijuana legalization. Support for medical marijuana has topped off in the high eighties or low nineties. And if the current trajectory continues, support for recreational legalization can be expected to continue its exponential increase, especially if more states successfully implement legalization. It is crystal clear that no age group, gender, or political party of Americans want the federal government to send the Drug Enforcement Administration (DEA) in to raid the 46 states that have legalized some form of marijuana. It seems that on this issue, public opinion is only moving in one direction. Unlike public opinion, federal law regarding marijuana hasn’t changed since the passage of the Controlled Substances Act in 1970—but federal enforcement of those laws has significantly evolved over time. The President, through the Department of Justice and DEA, has a great deal of control over how federal marijuana laws are enforced, especially when they conflict with the laws of a state. This wide berth has created uncertainty and a constant flow of new stances over the last two administrations, and it leaves open serious questions about what to expect from the Trump Administration on this issue. Under President George W. Bush, the federal government strongly enforced the federal marijuana ban. While no state had yet legalized recreational marijuana, eight had legalized medical marijuana by the time he took office and five more did so before he finished his second term. During the Bush Administration, the federal government cracked down on medical marijuana dispensaries across the nation, leading to arrests, seized property, and prison sentences for dispensary operators and growers. DEA raids and federal prosecutions created a culture of fear that permeated the industry even in states with legal medical markets. The Bush Department of Justice also argued and won two major Supreme Court cases bolstering federal authority to enforce marijuana laws. In 2001, the Supreme Court upheld a broad application of the Controlled Substances Act in U.S. v. Oakland Cannabis Buyers’ Coop­, declaring that medical need does not create an exception to the federal marijuana prohibition. And a few years later in 2005, it ruled in Gonzalez v. Raich that the federal government could still enforce the federal ban in states that had legalized medical marijuana. Though neither of these cases overturned state laws, they did reinforce federal supremacy and made it clear that state legalization does not protect market participants from federal prosecution. Consequentially, growing, selling, or using medical marijuana was a risky undertaking during the Bush Administration, regardless of the state in which one lived. President Barack Obama’s time in office saw a massive expansion of state legalization, and as the landscape shifted, his Administration rolled out a series of policy changes. As a presidential candidate, Obama pledged to roll back the aggressive enforcement policies of the Bush era, and initially upon taking office, he did so. In 2009, his Deputy Attorney General James Ogden released the Ogden Memo, announcing that the Department of Justice and DEA would deprioritize enforcement of the federal ban on marijuana in states where medical use was legal. This new policy led to rapid and wide scale growth of the medical marijuana industry—particularly in the west, where state laws and regulations were less comprehensive. As a result, the Administration shifted tactics in 2011, when Deputy Attorney General James Cole issued the First Cole Memorandum. Per this memo, the federal government announced it would focus its enforcement efforts against “large-scale, privately-owned industrial marijuana cultivation centers” and other similar operations, “even where those activities purport to comply with state law”—allowing the government to go after big market actors who were taking advantage of lax state laws. So states with strong laws like Colorado and New Mexico were largely left alone, while states like California and Montana with weak regulatory systems were returned to an era of greater federal enforcement. Preventing marijuana on federal property. They serve only those marijuana-related businesses that are complying with state laws. None of the federal priorities laid out in the Second Cole Memo are being violated. In exchange, banks are required to perform expansive due diligence on potential clients connected to the marijuana industry and file Suspicious Activity Reports flagging all marijuana accounts for federal regulators (noting whether or not they are legal businesses in the state in which they operate). While this guidance opened the door to some level of marijuana banking, it fell far short of solving the problem, as it can be revoked overnight and does not provide a defense from federal prosecution. While the Obama Administration took consequential steps to change the way the federal government enforces federal marijuana policy, none of these changes are set in stone, and none actually resolve the ongoing conflict between state and federal laws on marijuana. The future of federal marijuana enforcement is still uncertain under President Trump. The Second Cole Memo and FinCEN guidance remain in place, but no one knows for how long. And while the President has suggested in public remarks that marijuana—or at least its medical use—should be left up to the states, his Administration has already begun taking steps that indicate hostility to state laws on this issue. Just a few months ago, then White House Press Secretary Sean Spicer said that the President sees a “big difference” between the medical and recreational uses of marijuana. He also said that when it comes to the federal marijuana ban, “I do believe you will see greater enforcement it,” particularly as it relates to recreational use. Sessions’ appointment and his actions aren’t the only signs coming out of the White House. The President himself added a signing statement to the current government funding bill reserving the right to “take care that the laws be faithfully executed” on marijuana, despite Congressional language that prohibited him from cracking down on state medical marijuana laws. That’s an indication that the Administration may not agree with Congress when it comes to marijuana and could potentially be planning to ignore any attempts to curtail its enforcement activities. And in May, the Administration appointed five people to its newly-created Commission on Combating Drug Addiction and the Opioid Crisis. Four of those five are on the record in strong opposition to marijuana legalization—including Chris Christie, who threatened to come after Colorado’s legal market when he ran for president in the last election; Patrick Kennedy, who co-founded the largest anti-marijuana legalization organization in the country; Charlie Baker, the Massachusetts Governor who wrote a scathing op-ed opposing the legalization ballot initiative in his state; and Bertha Madras, a former Deputy Director in the White House Office of National Drug Control Policy under the second President Bush. Though it has become remarkably difficult to predict the actions of President Trump and his White House, it seems fair to assume that these players will not be leading the charge on reform. Instead, any progress on resolving the conflict between state and federal marijuana laws will have to be driven by Congress. Just as the last several decades have seen massive transformations in state laws, public opinion, and Administration policy, so too has Congress begun to shift on this issue. Despite uncertainty as to how the Trump Administration will address marijuana, support in Congress has grown markedly, especially with regard to medical marijuana. Instead of being viewed through a “tough on crime” lens, it is now commonly talked about by many on Capitol Hill as a matter of the Tenth Amendment and states’ rights. For others, marijuana reform is seen as a necessary component of criminal justice reform and efforts to reduce over-incarceration. The establishment of the Cannabis Caucus: For the first time ever, the 115th Congress is home to a bipartisan Cannabis Caucus, dedicated to educating Members and their staff about marijuana policy, bringing attention to the conflict between state and federal marijuana laws, and introducing bills to reform federal policy. Introduction of legislation: Two years ago, the bipartisan Compassionate Access, Research Expansion, and Respect States (CARERS) Act became the first major marijuana reform bill ever introduced in the Senate. Now, more than a dozen marijuana reform bills have been introduced thus far in the 115th Congress—in both the House and Senate and by both Republicans and Democrats—and many more are expected as this session of Congress continues. Passage of policy riders: Though there is currently only one marijuana-related policy rider included the federal spending bill—prohibiting the federal government from enforcing the federal ban in states where medical marijuana is legal—it may soon be joined by others. Several additional riders have passed out of at least one chamber of Congress, or come extremely close, in recent years. A rider preventing the Department of Justice from enforcing the federal marijuana ban in recreational states fell only 12 votes short in the House in 2015. Last year, the Senate Appropriations Committee voted to prevent the Treasury Department from prosecuting banks serving state-legal marijuana businesses. And in 2016 both chambers passed a rider that would have allowed doctors in the Veterans Affairs system to discuss medical marijuana with their patients—but it fell out when the House and Senate versions of the appropriations bill were combined. Public statements of support and hearings: The last time the House of Representatives debated marijuana funding amendments on the Floor, at least four times as many Members—from both parties—spoke in favor of protecting state legalization from federal enforcement as spoke against it. And unlike in the past, when marijuana was a taboo topic on Capitol Hill, in recent years it has become a common subject of hearings in both chambers. Marijuana policy and enforcement were even specifically brought up by Senators at Attorney General Jeff Sessions’ confirmation hearing and when Deputy Attorney General Rod Rosenstein testified before the Appropriations Committee. Though it is yet to have begun rewriting the Controlled Substances Act, Congress has very clearly spoken on marijuana policy—through the power of the purse. When Congress writes and passes appropriations bills funding the federal government, it has the ability to include restrictions that tie the hands of the Administration. That’s exactly what it’s done on marijuana with the bipartisan Rohrabacher-Farr Amendment—now the Rohrabacher-Blumenauer Amendment. This provision amends the current government funding bill to prohibit the Department of Justice from spending any money to prevent states that have chosen to legalize medical marijuana “from implementing their own laws that authorize the use, distribution, possession, or cultivation of medical marijuana.” It’s a clear instruction from Congress to the executive branch not to meddle where states have legalized medical marijuana. And it’s more than just advice. In passing this amendment, Congress has instructed the Administration in no uncertain terms not to interfere—and a federal Circuit Court of Appeals reads it the same way. Per a Ninth Circuit ruling, the Rohrabacher-Farr amendment prohibits the Department of Justice not only from preventing states from implementing their medical marijuana laws, but also from raiding businesses or prosecuting people who are following the laws in their states. First passed in 2014 by only a single vote in the Republican-controlled House, it has been included in every appropriations bill since, passing in 2015 with dozens of votes to spare, again in a Republican Congress. Every time it has passed—both on the House Floor and in the Senate Appropriations Committee—it has done so thanks to a bipartisan vote. And the Senate margins are even more conclusive—despite Republican majorities, the amendment passed out of committee with more than twice as many votes in favor as opposed in both 2015 and 2016. This year, the Senate Appropriations Committee passed it by simple voice vote. Unfortunately, while the amendment has been effective at protecting medical markets, it is not permanent. Because it is just a rider to a federal appropriations bill, it must be renewed each budget cycle, and is currently slotted to expire in September 2017 if Congress does not act to include it in the final version of the bill again. Ten years ago, few Members took marijuana policy seriously, even fewer were willing to discuss it publicly, and almost none were well-versed on the problems created by the conflict between state and federal laws. But times have changed and the 115th Congress has warmed to the topic as one deserving not only serious consideration but also real action. The change that has taken place over the last decade in Washington is remarkable—but also negligible compared to what’s happening in the states. States have been steadily passing legalization initiatives, both through their legislatures and via the popular vote, since the 1990s. Of the 29 states that have legalized medical marijuana, more than half—15—did so through their state legislatures. So far, each of the eight states that has legalized recreational marijuana has done so via ballot initiative. Vermont’s is the only state legislature in the nation to have passed a recreational legalization bill, but it was vetoed by the Governor earlier this year with instructions to address some specific concerns. Once their states decided to legalize marijuana for adult use, state policymakers of both parties have endeavored to make sure legalization is implemented successfully. Earlier this year, the Governors of Alaska, Colorado, Oregon, and Washington sent a joint letter to Attorney General Sessions, defending their states’ programs and urging the Department of Justice to not intervene. A detailed analysis of the ten states to most recently legalize medical marijuana legislatively finds that most bills passed with large majorities, regardless of the party controlling the chamber. In nine of those ten states, the measure passed with at least 60% of the vote in the lower chamber of the state legislature. And in all but Ohio, the upper house voted in favor of legalization with at least 58% of the vote. In several states, the bills passed with more than 80% or even 90% approval—making it clear that medical legalization on the state level has gained wide support across the ideological spectrum. Marijuana is even less of a partisan issue on the state level than on the federal level, though Democratic policymakers at all levels of government remain more supportive of reform than Republicans. In every single one of the ten states to most recently legalize legislatively, the majority passing the bill through each chamber of the state legislature was bipartisan. And while in nine of those ten states the Governor signing the bill into law was a Democrat, in the three most recent—Ohio, Pennsylvania and West Virginia—both chambers of the state legislature were controlled by Republicans. In fact, in Ohio Republican Governor John Kasich signed his state’s bill into law, making it the first to enact marijuana legalization through a process that was Republican-controlled at every stage. And the Democratic Governor of West Virginia who signed his state’s bill into law earlier this year—Jim Justice—has since announced he is switching party affiliation to be a Republican. When Vermont became the first state in the nation to pass a recreational legalization bill this spring, it did so with healthy majorities as well—20-9 in the Senate and 79-66 in the House. Though only a handful of Republicans voted for the bill in each chamber, when Republican Governor Phil Scott vetoed it, he said that he is not philosophically opposed to marijuana legalization and has since been working with the legislature on a new bill that addresses some specific concerns he had raised. Increasingly, marijuana reform is becoming a bipartisan issue in state legislatures, regardless of the party in power. That’s especially true for medical legalization, which is now the law of the land in the majority of states. We analyzed the state legislative and gubernatorial elections immediately following legalization in each of the ten states that most recently legislated medical marijuana, and we couldn’t identify a single instance of negative political consequences for elected officials who supported legalization of medical marijuana. We could find no state legislative races in which voting in favor of a medical marijuana bill was detrimental. Only two state senates flipped party control after legalization—New York and Minnesota—but in both the medical marijuana vote had been overwhelmingly in favor and bipartisan. Only two state lower chambers flipped party control as well—Minnesota and New Hampshire—but in neither state was marijuana a major campaign issue. Not a single Governor in any of these ten states lost a reelection campaign because he or she signed a medical marijuana bill into law—in fact, only one Governor lost their reelection at all (Democrat Pat Quinn of Illinois), and it was to an opponent who did not oppose medical marijuana legalization. It seems clear that legalizing medical marijuana is not a political liability for Governors or state legislatures. In fact, given the overwhelming popularity of medical marijuana, just the opposite may prove to be true going forward, especially as more states legalize and those that don’t are left behind. The policy landscape has changed dramatically around marijuana during the past 20 years. 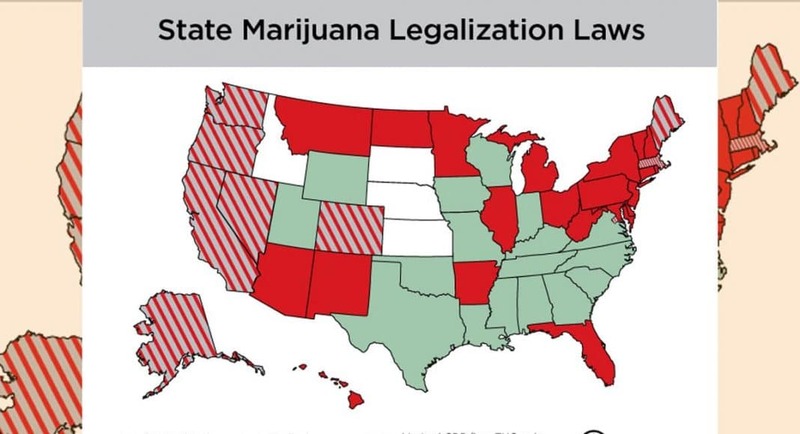 Roughly 98% of Americans live in states that permit some use of medical marijuana and roughly one-fifth of the country’s population lives in states where recreational use is also legal. Public support for legalization—and opposition to federal enforcement—is at the highest levels ever seen. And while there is uncertainty about what course the Trump Administration will take on marijuana policy, support in Congress and statehouses nationwide continues to grow. Increasingly, federal policymakers are recognizing the conflict between state and federal laws and are working to proactively to address it. That’s critical, because as the number of states where marijuana is legal expands, the need for responsible, safe, and smart governance is more important than ever. Nathan Kasai co-authored this report, which was originally published by Third Way, a Washington, D.C.-based centrist public policy think tank. Can Medical Marijuana Help Me With My Nausea?